The 2103 Cub Weekender Transcontinental is very versatile, as it can be towed by so many types of vehicles. It has strong springs, a reinforced chassis, 14” wheels and a heavy duty axel. Still able to be towed by most small to medium vehicles, it suits all SUV’s and some small 4WD’s like a Rav4 or Outlander, but can be towed by any vehicle with a ball weight capacity of 60kg. 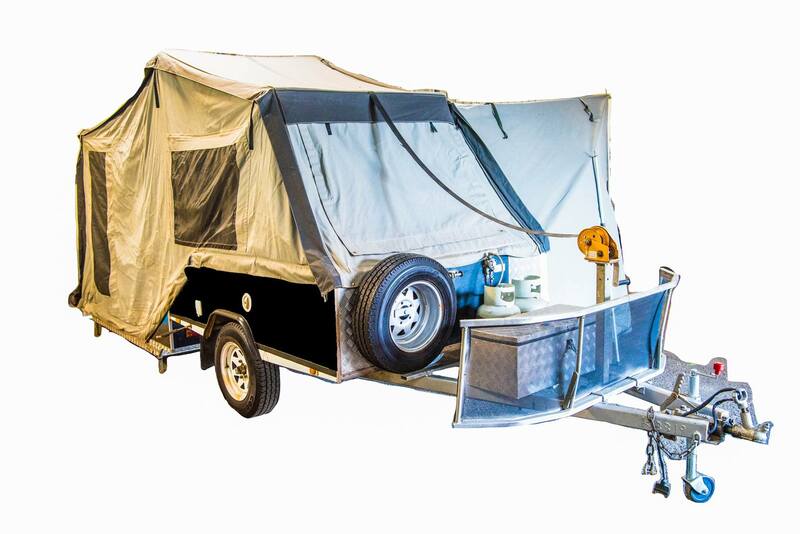 The Weekender Transcontinental comes standard with a 2 burner stainless steel roll out kitchen including sink with access via a hand pump to 60L of on board water. There’s also a roll out pantry drawer and a 4kg gas bottle, but there’s provision for 2 bottles. If you are staying at a powered site, simply plug a 15A extension lead in and take advantage of the internal power points just like at home. There’s an awning, complete with 8 poles that can be erected in less than 10 minutes, that measures approx 1.7m x 3.0m. Inside the trailer there’s a lift up double bed with plenty of under bed storage. The Weekender Transcontinental has a standard tow ball hitch . On the drawer bar, there’s a jerry can holder, 2 gas bottle holders and a small tool box. This trailer will be supplied matt black with Cub decal – once our business colours are removed prior to hand over. Trailer has been used as a hire trailer and has been serviced regularly at Cub’s workshop in North Rocks. Don’t have anywhere to store a trailer at home? Talk to us about a storage solution.